The day after discovering Yogyakarta town we were signed up for an organised tour of the temple of Borobudur – the whole reason we were here in Yogyakarta. I read a lot about this place, the Rough Guide to South-East Asia on a budget listed it as one of the top things to see and do in the whole of South-East Asia, so there was no way we were going to miss it. The day started super-early; we were getting picked up from our B&B at 5am. Most tour opearators also offer organised trips to the temples at sunrise, which means you would have to be in the temple by about 6am. That would have meant a 2 am start for us. We didn’t go for this option, instead we opted for being at the temple between 7 and 8 am. However if you don’t mind early starts I would definitely recommend going on the earlier tour to catch the sunrise. We caught some of the early morning mist lifting, but I can see what we may have missed in those first two hours of sunlight. Our minibus picked us up on time and then proceeded to collect 6 more passengers from town. The journey time to the temple in total was about 2 hours including collecting everyone and driving out of town for about an hour and 15 minutes. The temple of Borobudur is the largest Buddhist temple in the world, an important UNESCO World Heritage site, a jewel in Java’s and indeed in Indonesia’s crown. The temple was built in the 9th century and has been standing for 1200 years. The whole temple is built in the shape of a stupa. It has three levels and at the top level there is a main stupa surrounded by 72 smaller stupas, each hiding a Buddha. It truly is a beautiful place; surrounded by volcanoes and limestone cliffs, a place where a man-made structure and the beauty of nature forms a perfect whole. As we were walking around the site more and more visitors kept arriving and making their way up the steep steps towards the top tier of the temple. By the time we got up there there were tourists and local school children everywhere. The children were very sweet, they kept talking to us and smiling at us shyly, we even caught a few trying to take stealth photographs of us. One group of children aged between 12 and 16 started talking to us and asking us questions about where we were from and if we were enjoying the temple. We found out that they were actually undertaking their English language exam at that exact moment; their teacher was sanding behind them watching them intently. Part of their examination was that they had to speak in English in real life situation. Their English was great and they were very sweet, kept walking around with us and taking their tun to ask us questions. We also asked them about their school, their lessons, etc to make sure they also got to talk. Nut in the end we had to make our apologies and leave them as we had to start climbing down and get back to our minibus, where we were meeting the rest of our group. Our beautiful week in Gili Trawangan had quickly come to an end. We were so sad to leave this paradise, but after 6 days of just chilling out, soaking up the sun, watching beautiful sunsets and just generally living island life we had to pack up and move on. We booked our return journey to Bali on one of the Samayan fast boats and off we went. The journey back to Bali was slightly more comfortable. As soon as we arrived in Padanag Bai we were led to a minibus with 6 other travellers all heading to the airport in Denpasar. It took about an hour and a half to get there and then we just had to wait for our flight from Bali to Yogyakarta. In the meantime it made sense for us to slowly start moving up in the general direction of Thailand since that was going to be our final destination on our trip. So we flew to Yogyakarta which is located right in the middle of Java. We booked our accommodation just outside the centre of Yogyakarta, which afforded us our cheapest accommodation on this trip so far: £10 per night for the two of us in a private room with bathroom and a balcony overlooking a lush jungle terrace. Ok I make it sound nicer than it actually was, but we had quite a nice time there. We had breakfast on the terrace every morning where we were serenaded by a local guy playing local music and singing along beautifully. There were also many many birds in ornate birdcages accompanying him with their birdsongs (which was lovely, except it made Adam a bit uncomfortable seeing those beautiful birds all locked up). We walked into Yogyakarta centre on our first day with two objectives: to have a wonder around the city and to book our trip to Borobodour. First we headed towards the Kraton, which is the political and cultural centre of the city. It is also called the Sultan’s Palace and it is effectively a walled city within the city with its own shops, mosques, schools and art centres. Now you would think having been on the road for almost three months in South-East Asia we would have learnt a trick or two about scamsters. Well let me tell you – our naivety and trusting nature is unwavering. We already fell for a practiced speech of a less-than honest fraudster in Bangkok and instead of learning from our mistakes we fell for it again in Yogya!! The difference was that we didn’t even realize what was happening after way after it had happened. He tried to persuade us to go to a local art-centre instead where local art students exhibit their beautiful and unique Indonesian batik art. And because it’s just students we don’t have to buy anything, we can just just look, he reassured us. This guy’s scheme was way more sophisticated than the Bangkok guy’s was – he could tell I had my suspicions. When we said our goodbyes Adam and I quickly started walking in the opposite direction to the one he suggested. 5 minutes later we were approached by another guy, a very jolly looking fella, who started talking to us as we were walking along. Just normal chit-chat, where are you from, where are you going, etc. He then told us he is going to the hospital and he will take us to this batik shop as it is on his way. I immediately knew what was up, but Adam just kept chit-chatting, he was so nice, not suspecting a thing, just thinking what a lovely man this was. He was lovely, no question about that, but somehow, even though we tried not to, we still ended up at the batik house. He walked us all the way to the front door. Conveniently, it was right on his way to the hospital!! Hmmmm…. Adam did not suspect anything until a bit later I just kind of muttered to him that ‘you do realize we just got scammed again’. He didn’t want to believe me, but when it finally dropped he was gobsmacked! Oh dear, we really are so naive and easily-led. After our detour to the batik shop we headed to the Khao San road of Yogya, Jalan Sosrowijayan. I did mention already that this city is a bit less known for travellers, didn’t I? Anyway the street was almost deserted. Still, we had some nice lunch and drinks on a terrace above the street, had some of the traditional local Nasi. We then went to one of the tourist office guys and signed up for our trip to Boroboudur next day. This is after all why we were here, Indonesia’s most important cultural sites, 4am start, bring it on! In my last blog post I talked about how we got from the heart of Bali, Ubud to the Gili Islands. I hope you enjoyed the photographs I shared of Gili T (as it is affectionately known). Those are some of my favourite photographs of our whole time away in Asia. I just look at them and feel happy. I look forward to sharing more Gili Trawangan photos in this post. But first things first: I have to tell you a little bit about this amazing island. The three Gili Islands are located between the island of Bali and Lombok. They are about an hour and a half fast-boat ride from Bali and a ten minute fast-boat ride from Lombok. They are actually just off the coast of Lombok. Most travellers make the journey to The Gilis from Bali. However as Lombok is now getting more and more popular as a tourist destination, you can also just spend your holiday in Lombok and go to the Gilis for a day trip. You can of course fly into Bali. The international airport in Denpasar is only about an hour and a half away from Pedang Bai, where you can catch your fast-boat to the Gilis. However Lombok also has its own international airport and you can catch a 3 hour flight here from Singapore. You can then get an airport transfer to Bangsal, the departure point for boats towards The Gili Islands. Once you arrive on Gili Trawangan you will immediately notice that there are no scooters here. There are no motorised vehicles of any sort in fact as they are not allowed. Instead, the main modes of transportation here are cycling, walking or taking a ride on a Cidomo. A cidomo is a horse-drawn cart, which the locals use for transporting everything from building materials, to shop supplies as well as passengers and their luggage. Adam and I loved the idea that the locals were trying to preserve the authenticity of the island by not allowing any motorised vehicles. I hope this will stay like this for a long time. On the other hand, the cidomos can be a bit controversial. Some people might not like the way the horses might be treated. We took a ride a couple of times on a cidomo, and one of the guys was certainly a bit heavy handed with the whip. However the island is small, you can get anywhere on foot. Every morning boats upon boats arrive on the shores of Gili Trawangan and bring in new supplies, food, drinks, ingredients, materials and so on. It’s fascinating watching the locals work together on the shore to get everything off the boats and distributed as quickly as possible. Interestingly the Gilis also don’t have their own fresh water supply and water is also transported here from Lombok. On Gili Trawangan desalinated water is now available, but many accommodations still only have salt water showers. You should not drink tap-water, but bottled water is available everywhere as it shipped in from Lombok every day. As an alternative you can also drink coconut water, which is the most refreshing drink ever! I loved it! I drank it at every possibility I had. A whole coconut cost about a £1. Bargain, if you think how much you pay for a teeny-tiny carton of coconut water in the UK! When you first arrive from Bali you might notice that the Gilis are no longer Hindu. 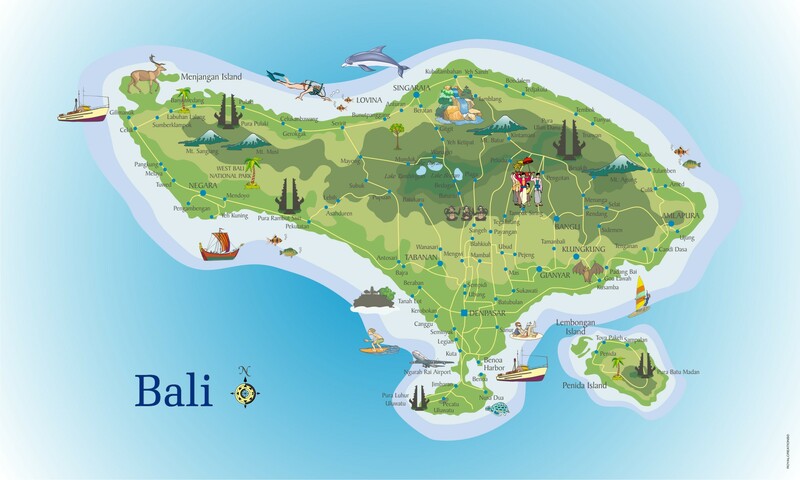 In fact Bali is the only Hindu island in the whole of Indonesia. The Gilis are home to the Sasak people who are predominantly Muslim. All three of the Gilis have a mosque and the call to prayer can be heard on the islands 5 times a day, the first one at around 5 am. Earlier in our travels we spent a couple of weeks on the Thai island of Koh Tao, which is undoubtedly the scuba divers’ number 1 paradise destination. Adam did research other Asian scuba diving sites and Bali kept coming up. Now what we also discovered is that the Gilis have amazing diving sites! So much so that I believe the first tourists who discovered the islands’ potential were travelers looking for diving opportunities. Now Gili Trawangan beachfront is lined with scuba diving schools so you can take your pick who you want to learn with! But if you don’t feel like scuba diving, you mustn’t miss snorkeling! There are plenty of opportunities to go out as part of a small group on one of the snorkeling boats circling all three islands. Even if you don’t feel like going with a group, you can grab and rent snorkeling equipment on every corner. This is what we did and we only had to swim about 20 meters off-shore to come across a stunning giant turtle! We came about as close to it as possible without touching it (try not to touch the wildlife underwater while diving or snorkeling). Gili Trawangan is not exactly the sleepy paradise island that you may think it is. Out of the three Gilis, Trawangan has definitely grown into the party destination. The East side of the island is lined with restaurants, bars and pubs and walking along this stretch after sunset means that you will inevitably end up in one of these establishments for a drink and dance. You should definitely start your evening in the night market – this is where most people on a budget come for dinner. It’s basically rows upon rows of street-food carts with the most amazing dishes at a fraction of the price of a restaurant meal. There are party boats 3-4 times a week as well if that’s what takes your fancy, I’ll be honest we didn’t really go for that. We went to a full-moon party while we were on Gili-T, but it was sooooo windy by the sea that night that we left before the crowd really got going. We’re a bit old now, so we don’t hang around if we don’t love something 🙂 The music was good though, so maybe next time we’re there. There is of course an Irish bar here, like in most places in the world and that seemed to be the most happening place while we were on Gili T.
I have to say I love a good sunset-watching. And I honestly do think that the sunsets we saw on Gili Trawangan are amongst the best ones we have ever seen. There is a bar on the Western side of the island, the Paradise Sunset Bar that is THE place to be for a bit of sunset watching with cocktail in your hand, reclining on a giant bean-bag on the beach, with quiet chill-out music in the background. You can’t beat it. Another popular spot for watching the susnset is on the top of Sunset Hill, which is a 100 metre high lookout point on top of the island. It takes about 15 minutes to walk up there from the village. You can usually find another group of people sitting in the grass with a bottle of beer for the exact same purpose. Just make sure you have a torch with you – once the sun dips below the horizon it gets dark really quickly and you still need to quickly find your way back down. There are no police on Gili Trawangan. The island is run by the village head. He gets to make the final decision on most matters, for example he banned gambling, pool tables and even dogs!!! Yes, you heard it right – dogs are not allowed on Gili Trawangan, there’s not one of them on the island. Although there are no police, the island still feels very safe. it again in my life. If you are ever in Bali, you really must as it is so easy to get to, you cannot miss it!